After the lesson, I’m so glad that I was left with no choice but to learn. Without my mom taking action, it may have been years before I decided to learn on my own terms, and that would not be good. Who would cook Lao food for me when I’m no longer living at home? Scary thought since I know I’ll crave the food I grew up eating, and I’m fully aware it is hard to come by. 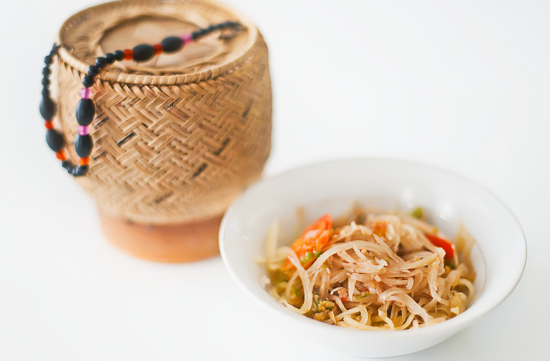 Lao cuisine is slowly gaining popularity, but it is still not a mainstream type of cuisine. There aren’t very many Lao restaurants out there. Thai restaurants are mainly owned by Lao people, and do offer a few Lao dishes, but the flavors are made with an American flair, which makes it less authentic, and doesn’t quite fit the taste in which I’ve been accustomed to. I'm a little ashamed of the fact that it took me this long to learn. Just by learning how to cook with my mom, I was able to connect with her at a different level, and learn things I didn't know about her and the beauty of my culture. Through the stories she told and history lessons she gave while cooking, it sparked something inside of me! There is such a rich culture behind who I am, and for the first time, going to Laos with my parents is no longer just something I know I'll have to do someday, but something I look forward to. I want to go to the country my parents left behind, and see where my parents came from. To be able to visit my dad's small village, meet all of my relatives that are still in Laos, walk the field of rice paddies my dad once harvested with his own two hands, and sleep in the the house he grew up in -- that would be amazing! I want to see for myself the beautiful country of Laos, and the culture my family is so proud of. My mom says, “Life is like a book, it’s hard to read and understand a story with missing chapters.” She is right, there is a chapter missing from the story written about my life thus far, and I don't want that part to be a mystery. It is crucial for me to learn who I am and where I came from in order to fill those missing pages. It may have taken me longer than others to finally accept and understand this piece of who I am, but from this point on, I’m open and willing to begin the process of learning.